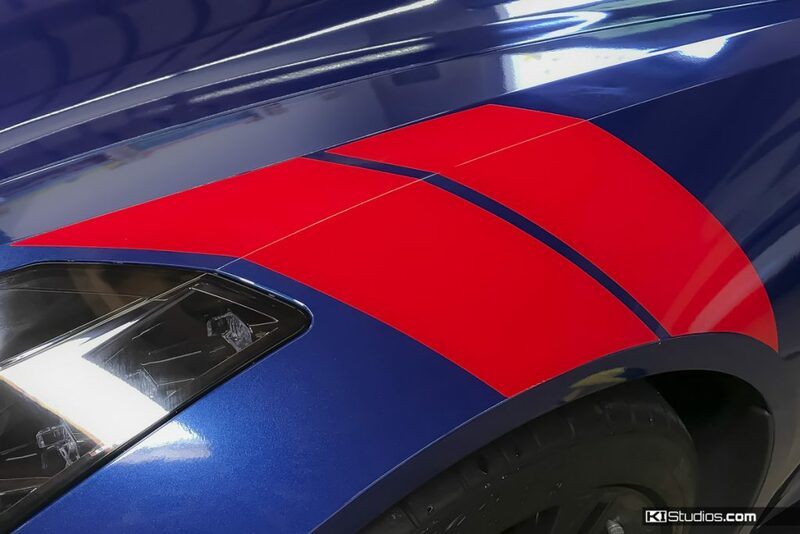 We have designed a number of unique Chevrolet Corvette C7 stripes using our tried and true techniques. Many Corvette enthusiasts have asked us to use the same design expertise and attention to detail that we use for our Porsche stripes, but for the C7 Corvette. We have since designed some products for the C7 Corvette and placed them in our online store. Essentially, our aim was to create a few Corvette C7 stripes that would be in line with what a traditional Corvette owner would like. This means the stripes need to similar to factory stripes, or a design that the factory would perhaps create. Many traditional Corvette owners do not like to modify their cars. They like to take care of them and keep them very close to a factory look. There are plenty of exceptions of course. One reason is that they don’t want to upset what are already good looks. The other reason is they would rather not make permanent changes to their car that would put the resale value in jeopardy. This is the case even if they are not planning to sell it anytime soon. That is the beauty of KI Studios vinyl stripes. They are designed to fit perfectly and a look great while being only a temporary change. The stripes will last as long as you want them too based on how well you take care of them. But at any point in time you can easily remove them to return the car to a pristine stock look. This allows the Corvette C7 owner to enjoy a bit of cosmetic modification while remaining 100% reversible, which in turns protects their resale value. In keeping with this approach we offer a couple of nice stripe upgrades for your C7 Corvette that come ready for DIY installation. Traditional dual stripe Corvette C7 fender hash marks. The first thing is the Corvette C7 Hash Marks. These are the marks that go over the front fenders on the Corvette Grand Sport. Since Chevy has changed the approach through the years and offered hash marks on one side or both sides of the car depending on the generation, we’ve decided to allow the customer to choose. You can either buy the driver’s side marks, passenger’s side marks, or both. For your reference, C7 Grand Sport factory option is for both sides. The C6 Grand Sport also has hash marks on both sides from factory. The C4 Grand Sport was only offered with hash marks on the driver’s side. 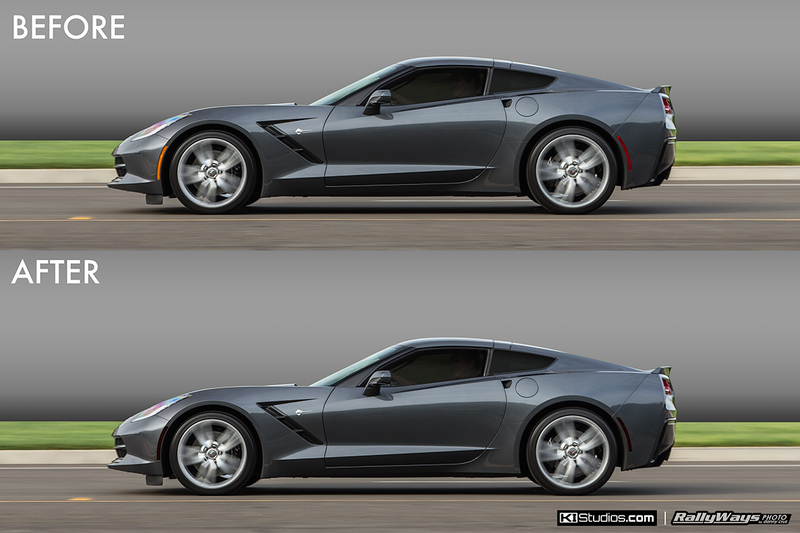 While we were at it, we also created a hash mark option that is connected at the top, much like the factory hash marks on the C7 Corvette Grand Sport. This one seems to be the most popular. The other option is for those that want more classic dual stripe hash marks. Hood stingers are very popular with various American sports and muscle cars. A hood stinger is a decal that covers only a small portion of the hood, generally top center cowl area. This is normally the raised area that a lot of classic American muscle cars had to allow clearance for the raised carburetor cover. The design cues of the raised hood have carried over to today, even though the necessity for a carburetor stack no longer exists. On some cars, like the C7 Corvette here, the hood stinger area is actually recessed instead of raised. While gloss black and matte black are the most popular colors for Corvette C7 hood stingers, you can choose between red, blue, yellow, orange, green, white, silver, anthracite and matte platinum grey. 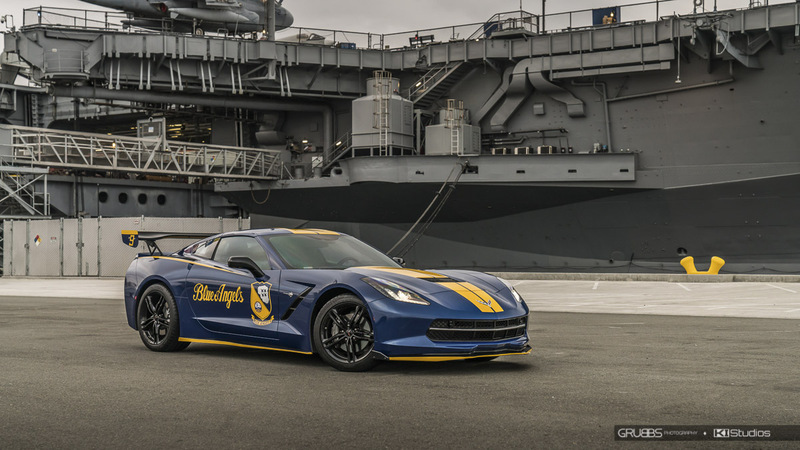 Blue Angels Corvette with KI Studios top dual stripes. 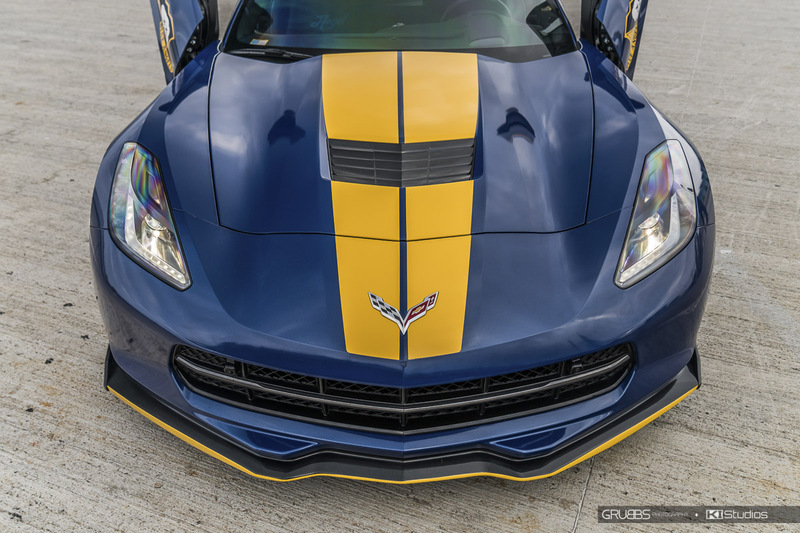 As far as full stripes go we offer complete over the top stripes for the C7 Corvette Stingray. These stripes are designed for a perfect fit to the C7 Stingray’s top contours and body panel lines. They start at the sharp top crease of the front bumper and extend all the way back to the end of the trunk lid. Like the hood stinger, you can choose between any of the colors in our repertoire to match the look you are going for. Finally, we have custom designed side maker blackout trim for each of the 4 corner reflectors on the car. Installing these allows you to tone down the bright orange and red of the stock corner markers for a stealthier look. All KI Studios Corvette C7 stripes are designed with the same level of precision and care as our Porsche, Ferrari and Lamborghini stripe kits. We only use the industry’s top tier materials. The quality of the automotive vinyl means that it’s easy to work with and paint-safe. You can enjoy them for many years and take them off when you’re ready to move on or want to change to different stripes. Most of these kits are designed for DIY installation. However, if you don’t feel confident installing it yourself, you can hire a local wrap shop or clear bra installer to install the stripes for you. See all Chevrolet Corvette C7 Stingray Stripes.